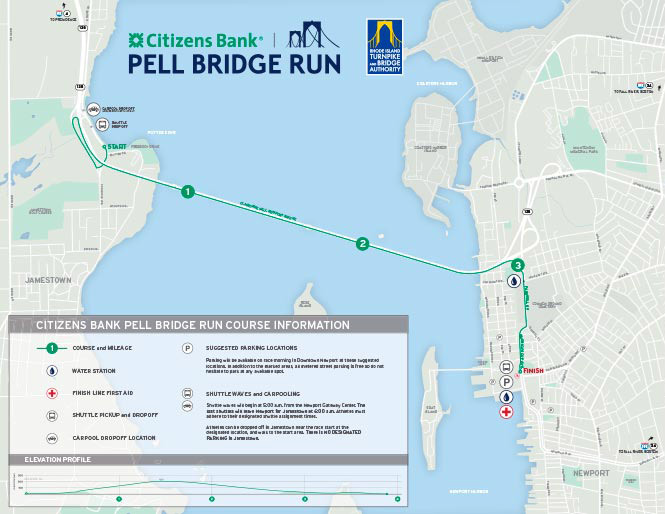 The Citizens Bank Pell Bridge Run provides a unique but challenging 4-mile course with one major “hill” – rising at 4.8% grade to 215 feet above sea level! The timed race is open to runners and walkers and starts in Jamestown, crossing over Narragansett Bay and finishing in Downtown Newport. Registered runners and walkers are welcome to enjoy the Newport/Pell Bridge, however, all participants must be off the bridge in one hour. This requires a 3 mph. pace. All participants unable to maintain this pace will be escorted off the bridge by race officials.